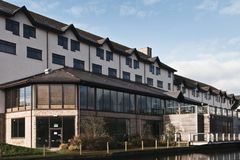 The comfortable Copthorne Hotel is ideally placed for access to Cardiff city centre, the M4 motorway, and the international airport. The rooms offer excellent accommodation in a traditional environment, decorated in warm colours. The hotel has all the facilities that are required of a good city hotel, ensuring that those visiting Cardiff for a golf break or tour will relax in style. With 135 guest rooms and suites, there is something for everyone, especially golfers, who will be delighted with the ease of access to the golf courses of the local area. Raglans Restaurant, serving a variety of Welsh and international cuisine, is one of Cardiff's best-kept culinary secrets. The Burgess Bar is ideal for enjoying a drink with friends.